Its been about 7 weeks since my blue water adventure came to an end – it seems much longer then that. Since then I have been on the road exploring as much as I can of Australia. On March 12 I left for Peth and spend two week going seeing a tiny part of Western Australia. Currently I am hanging around Coffs Harbour resting and planning the last month of my visit. March 6, 2009 marked the end of our sailing voyage for most of the crew and for me closes this chapter – for now. For the next 3 months I will be exploring as much of Australia as I can. You can catch up on the Falcon GT by going to the Falcon GT website. 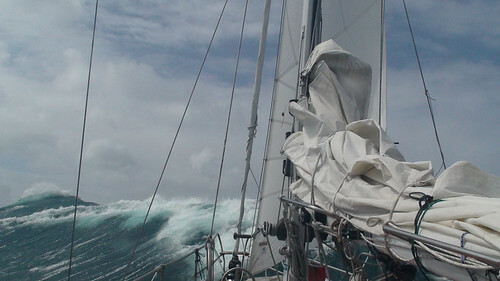 To anyone with the fascination with blue water sailing the Southern Ocean is an ocean that sets the imagination alight. Now where the Southern Ocean starts is up for discussion but sailors believe it starts at the Roaring Forties. 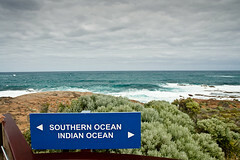 Australians consider the sea below the continent the Southern Ocean. Stories of angry storms with howling gale winds and waves described as liquid Himalayas; where boats are pitched-poled and dismasted sends shivers down any salted sailor. But those same stories are what ignite the imagination of adventurous seamen. They dream of sailing to the ends of the world and the crew of the Falcon GT was no different. Over the seven weeks of sailing along the 40th parallel, the Southern Ocean would reveal it many moods, some unexpected others confirming it as the wildest place on Earth. Introduction to the Southern Ocean was gentle. 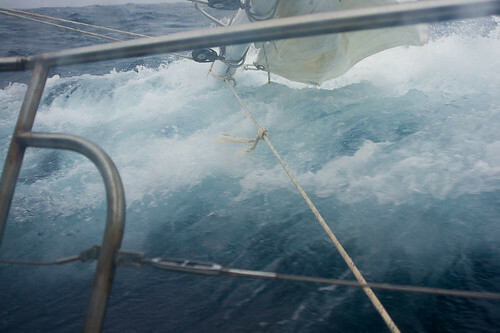 We reached the Roaring Forties in light variable southerly winds ghosting along steal blue seas with kind swells. Having pushed into the mid forties we finally ramped onto the westerly highway, riding the massive systems that quickly move from west to east. And like a highway there would be times that we would be speeding along surfing down steep waves or stopped dead still in a windless vacuum. We found that the Southern Ocean is not all wind and waves, but as weather systems moved through a predicable pattern would emerge. With approaching lows the days would be gray as leaden clouds covered the sky, soon letting loose their load of steady cold rain. Winds build and steadily blew around 20 to 25 knots as the seas would build but never in a frighten manner. Under reduced sail, it was a miserable time. Steady rain and the odd breaking wave everything became wet. It was a lonely time to be on watch with the cold damp seeping through the layers to the bone. Cold and wet, those not forced on deck stayed below sleeping, reading and trying to stay warm and dry. This weather would be replaced by a series of cold fronts. As the fronts passed, the rain would stop revealing blue skies and warm sun. Winds continued to blow 20+ knots, but squalls would pass through and black clouds would obscure the skies and horizon and winds would instantaneously reach 40+ knots. Waves now steadily grew bigger and bigger. Sailing was a mixture of exhilaration, fear and some frustration. As we surfed down the waves, boat speeds would go into the double digits. Foam boiled around the boat and the sea hissed. Standing behind the wheel the feeling was exhilarating. But the feeling was tainted with fear with the knowledge that we were sailing on the edge. The wind was directly behind – Falcon GT was running dead down wind. Any loss of concentration and we would jibe sending the boom swinging across the deck in a violent and saddened explosion. Or we could broach with the boat propelling into the wind – even with the rudder turned with all our might – exposing our beam to the onslaught of the breaking waves. Between the squalls, the wind would drop to a clam 20+ knot and the sun would shine. However now we were under canvassed. Not enough sail area and the boat would lose speed and steering became a challenge in the wild seas. Frustrated we would curse the lack of sail, but looking around and see the darkness approach the next squall was not far. It would this type of weather that would see us end our sailing early sending us to Apollo Bay, Australia seeking shelter and relieve. Of all the cold fronts, we had seen this was the worst. Regularly squalls would pass through, coal black clouds obscuring the sky and screaming winds would reach into the mid and upper 40+ knots. At one point, we recorded 59 knots of wind. Sailing with only the staysail it was a mixture of heart pounding exhilaration and white knuckled fear. Now the waves became mountains, their breaking tops looking like jagged snow covered peaks. The gusting wind would chop the top off waves, looking like driving snow in a winter storm. All around the boat, waves would break into large patches of white. At times, the waves would break on top of us filling the cockpit with white obscuring the helms man from view. Numerous times, waves would break off our quarter sending the boat on to it side and throwing us around. The boat planned down the sides of mountains. I hit a speed of 19 knots while steering and Doug G. has the record of 23 knots of boat speed – hull speed is a mere 8 knots. Taking our turn at the wheel for two hour at a time, we broached, jibed and surfed. It took a toll over the hours and that is when we decided to go to Apollo Bay. Once the cold front passed through the calm set in, winds died and clear skies returned. This was our rest day(s). Cloths would be hung out to dry and friendships renewed as we all hung out in the cockpit enjoying the break in weather and waiting for the next system to come. And so it would go, calm to ideal sailing to cold, wet miserable sailing to white knuckled sailing. The Southern Ocean has it all. But in its final send off it ensured that its reputation as a wild place on the edge of the world would be secured. It has been about a week since the Falcon and her crew reluctantly left Simon’s Town, pushed by schedules and impatience. 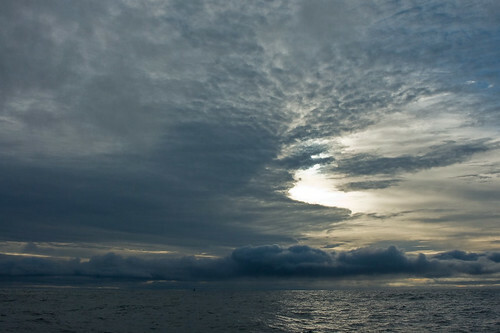 We have reached the 40 degrees latitude – the Roaring Forties of the Southern Ocean, and roaring it has not been. We ghost along, heading east, in light variable southerly winds that are cooled by the Antarctic. The steal blue sea is calm with gentle swells (no liquid Himalayas – yet). The sun, when not hidden by the low grey clouds, is hot and the Milky Way is bright and crystal clear. We wait for the westerly winds driven by the train of lows expected in this region, to push us more quickly towards Australia. For now, sailing has been relaxed with everybody enjoying the weather. In the last week, the wildlife has been spectacular. Outside False Bay, on the day of our departure, we saw seals everywhere floating and swimming on their sides with their flippers high in the air. Once again, a large pod of dolphins graced us by leaping out of the water as they quickly passed us by. One morning, shortly after dawn a lead grey fin appeared right next to the boat. As I peered down the shark twisted and turned showing its white belly and unsmiling mouth as it looked up at me. Then the shark turned and slid away with a lazy motion disappearing beneath the dark water. I had just seen a Great White. And there be whales. Doug G, John and I were sitting in the cockpit soaking up the southern summer sun when looking out the stern I saw the water erupt like a volcano. “Whale”, I shouted and everybody went for his camera. 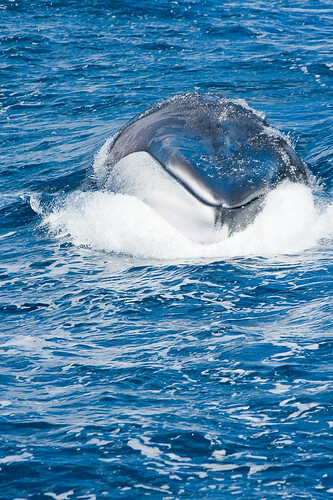 For the next entertaining half hour, the whale (species unknown) followed us close behind, every few seconds broke the surface of the water showing us its dark blue back and white belly, and smiling face. The show concluded by a clear out-of-the-water explosive breach mere meters away, which my camera caught only the resulting huge splash. As the whale swam off it offered two encores of it breaching as it disappeared into the distance leaving an elated audience. The seabirds have been our constant companions and they are a joy to watch. There have been varieties of petrels and albatrosses, which continually follow the boat. 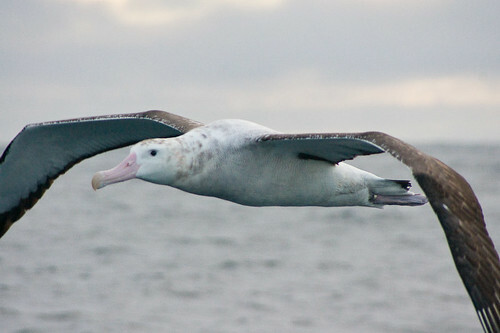 This includes the large and very rare Wandering Albatross with a wingspan of nearly 4 meters. 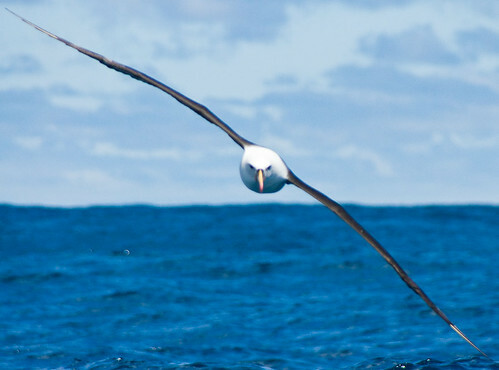 With long slender glider like wings, the albatross mesmerizes as it silently soars mere centimeters from the water surface following the swells then rocketing for the sky and back down again; doing so all around the boat. Given how rare they are (an estimated 8,500 breeding pairs left) we were blessed to see three of them together doing their graceful flybys and I feel intensely privileged to have seen these birds as they are destined for extinction due to current human fishing practices. The Roaring Forties is not what I expected given what I have read. So right now, I am enjoying the show waiting for the Southern Ocean to reveal its true self. Copyright © 2007 The Reflective Sea. Darkwater Theme by Antbag.